Reminder: Sunday's G/60 Quads Start At 12:30. A reminder: Registration for Sunday's G/60 Quads is from 11:45 a.m. to 12:20 p.m. The 1st round will begin at 12:30. Final Open Section Standings, in tiebreak-order. Congratulations to the 19 trophy winners and thanks to all 38 who participated. The U750 & U1250 players who did not receive their trophies this evening (Arav, Pranav, Justin and Omkar) will get them will on their next visit to the Westfield CC. Our next Scholastic event will be on January 17th, 2016. From L-R: Asgar Musaji (5th place), Alexander Chen (4th), Brandon Wang (1st), Kyril Kavetsky (2nd) and Harrish Ramanujam (3rd). Final U1250 Standings, in tiebreak-order. From L-R: Alan Weintraub (2nd place), Eric Levin (4th), Dhruv Dodda (3rd) and Andrew Deng (1st). Aayush Ajith (1672), Brandon Wang (911) and Andrew Deng (666) were section winners in today's Westfield Fall Scholastic, which featured 38 participants. 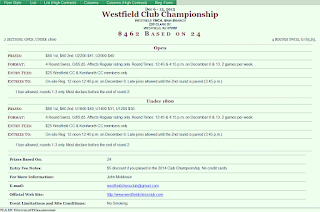 On Sunday afternoon (Oct. 18), the Westfield Chess Club will be running its Fall Scholastic tournament. Registration is from 1:15-1:45 p.m. The 1st round is at 2:00. If your child needs to join the USCF, please sign him up this week or arrive early (before 1:30). Reminder: Tomorrow's Swiss Starts At 12:15 p.m. Reminder: Registration for tomorrow's 4x45 Swiss is from 11:30 a.m. to 12:05 p.m. The 1st round will begin at 12:15. If you arrive after it is paired you will be given a half-point bye unless we have an odd number. 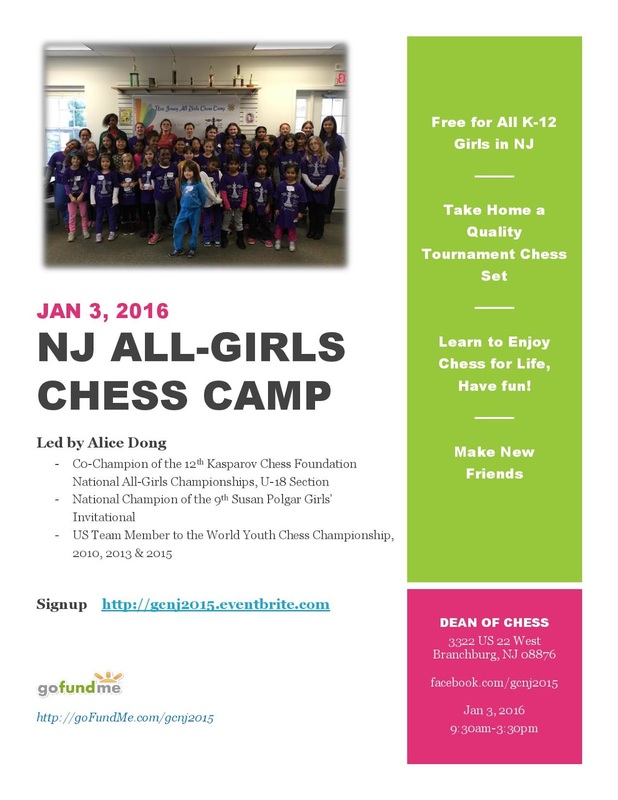 On Sunday, January 3rd, 2016, Alice Dong will be leading a free, NJ All-Girls Chess Camp at the Dean of Chess Academy in Branchburg. 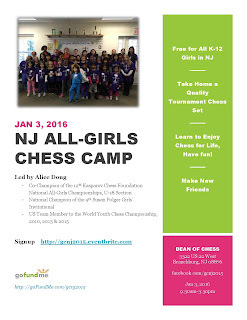 To make a donation, visit http://www.gofundme.com/gcnj2015. 4x45 Swiss Next Sunday. 1st Round: 12:15 p.m.
On Sunday, October 11th, we are running a 3-section (Open, U1800, U1400), 4-round G/45 Swiss. Registration is 11:15-11:50 a.m. The 1st round is scheduled to start at 12:15! The Westfield Chess Club will be closed on Sunday, September 6. Our next event will be the September 13th Octos. Beginning on July 26th, our G/45 Quads, G/45 Octos and Scholastic tournaments will begin at 2 p.m. Registration will be 1:15-1:45. The earlier starts should provide players 15-minute between-round breaks and permit the Chief TD to submit the USCF report on-site. Paired players will still have the option of starting their games early. From L-R: Jason Covey (5th place), Stanley Liu (2nd), Beata Gelman (1st), Luke Drennan (Honorable Mention), Christopher Giordano (Honorable Mention) and Abinav Mundayat (3rd). Congratulations to the 20 trophy winners and thanks to all 48 who participated. The Honorable Mention winners in the U750 & U1250 sections will receive their trophies on their next visit to the Westfield CC. Our next Scholastic event will be on October 18th, 2015. From L-R: Eric Li (2nd place), Neil Samant (5th), Daniel Dragonoff (1st) and Asgar Musaji (4th). From L-R: Alexander Kotelnikovov (1st place), Wendy Jin (2nd), Arav Katakam (3rd), Aneek Mahajan (4th) and Rohan Narayanan (5th). Beata Gelman (1639), Daniel Draganoff (1234) and Alexander Kotelnikov (708 on the July rating list) were section winners in today's Westfield Summer Scholastic, which featured 48 participants. As a replacement, we will be running a dual-rated event, G/45 or G/60 tournament. The starting time, exact format & other details will follow. My apologizes to those who were looking forward to attending and/or participating in the various attractions. Any future Chess Fest endeavor will be given more thought and a more appropriate date. On Sunday afternoon (July 19), we will be running the Westfield Summer Scholastic, for K-12 students. Registration is from 1:15 until 2:00 p.m., on site only. The first round begins at 2:15. Those arriving late will receive a half-point bye for round 1. 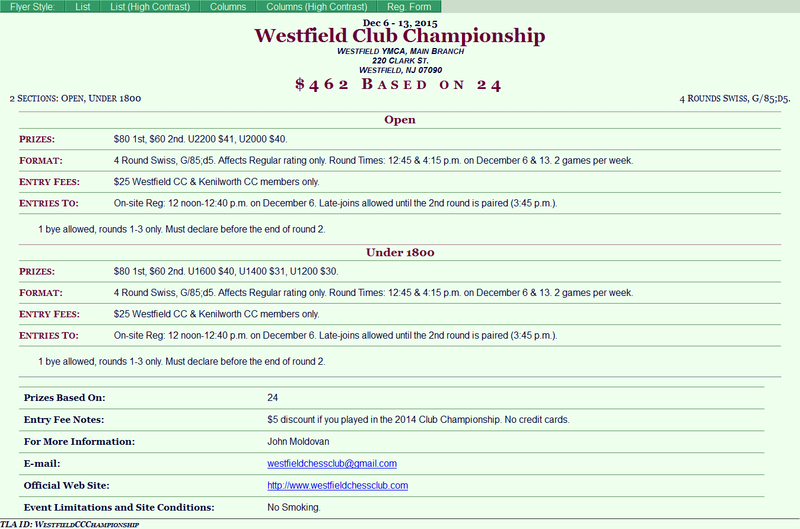 The entry fee is $20 for Westfield CC members, $25 for others. Trophies will be awarded to Top 5 in each section. Tiebreaks will be used, per USCF rule 34E. The U750 & U1250 Sections will play 4 rounds of G/25 d5. The Open Section will play 3 rounds of G/40 d5. Long-time Westfield Chess Club member &amp; TD Ernesto Labate passed away on Monday, at the age of 92. In lieu of flowers, donations may be made to JFK Haven Hospice &amp; Palliative Care, Edison, NJ. Due to construction at the Westfield YMCA, we cannot run the planned G/60 Quads or 4x45 Swiss. Thus, we are going with another set of G/45 Quads in late July and early August. We have no idea when the Y construction will be completed and have been told it is 3 months behind schedule. Construction at the Westfield YMCA in the coming months will make rooms 107-109 unavailable to the club. At present, the Y cannot tell us when the construction is to begin or guarantee us use of the Kellogg Room (or anywhere else) when it does. Thus, we have decided not to place TLA for our June 21-July 12 events in May's Chess Life. We will list them in the June issue, place online TLAs and await developments. If the Y can give us a guarantee by April 10th, we will return to the usual 2-issue advertising for July 19-August 9. If not, we will continue going month to month.